A small, boutique winery located at 2000' elevation atop of Spring Mountain. Known for its designate Cabernet Sauvignons from the Spring Mountain appellation. Tasting at Barnett Vineyards is a unique and intimate experience arranged by appointment only. Not only are we known for our magnificent wines, but we also offer one of the best views of the Napa Valley. Our tastings go hand in hand with an introduction to the property, its vineyards, and the wines. 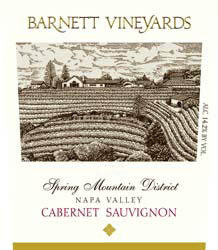 To join the wine club, visit www.barnettvineyards.com or call 707-963-7075.